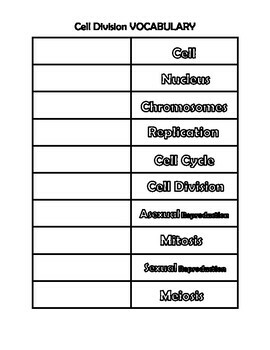 Cell Division vocabulary. 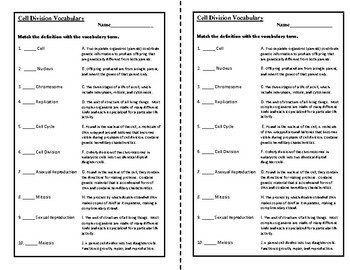 A practical adaptation for students who struggle with traditional note-taking is vocabulary cut, match-up and pastes. It helps students to think critically, to use textbook skills to look up definitions and employs a tactile strategy which helps to become more engaged with their learning. I also find students retain the information better. 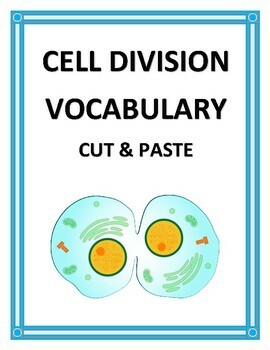 This package includes one vocabulary cut and paste for the vocabulary for Cell Division. The package also includes a comprehension quiz. 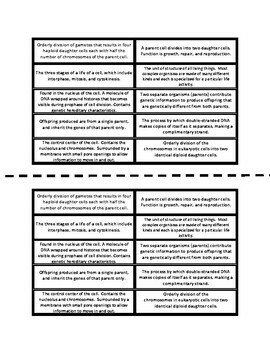 This activity is also in my complete unit on the Reproduction which is available in my store.